You are genuinely passionate about the work of an assistant and understand the importance of the role in the organization. You are a people person and enjoy making connections. You are exceedingly well organized, thoughtful and empathetic. You have exceptional communication skills, paired with great attention to detail. You are a natural problem-solver and are energized by a fast-pace environment. You are self-motivated, and demonstrate initiative, flexibility, and great judgement under pressure. You are excited to work with a diverse global team, helping foster collaboration and innovation. We are seeking a Senior Administrative Assistant to support two members of our senior leadership team with a wide variety of responsibilities. This role is instrumental in helping the entire office work more effectively. You would be the administrative engine that keeps our team running efficiently and on schedule. To make sure you start your day energized and ready to work, we provide a catered breakfast every weekday morning, and unlimited snacks and drinks are available all day. Our collaborative, open-plan office space is filled with talented engineers and product team members who enjoy taking advantage of our weekly Tech Talks and hanging out with their co-workers, playing ping pong, and attending other office events. Our team here at the San Francisco Pivotal office is a creative, smart, fun, and kind group of people. If this appeals to you, submit an application! Strong proficiency in Google Apps/business suite and familiarity with MS Office, including Word, Excel (Pivot Tables), PowerPoint, and Outlook. Experience with Concur is preferred, familiarity with Trello is a plus. The ability to work independently, manage time well, and react to changes in plans with a sense of urgency. Managing projects is a plus. Attention to detail and reliable follow through with a high level of accuracy. Possess a strong ability/desire to learn new software tools - You like to find new ways to organize your day and handle tasks more efficiently. 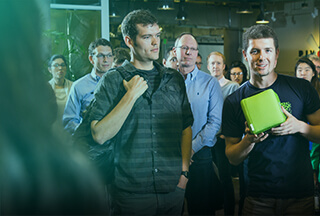 Please Note: Much of Pivotal’s work in the Washington DC office is with Federal Government customers that require our employees involved with their projects by U.S. citizens. As such, this role requires U.S. citizenship.